As they say goodbye to the long hours of studying, the late night cram sessions and the difficult exams, remind them what it was all for: receiving their diploma on graduation day! 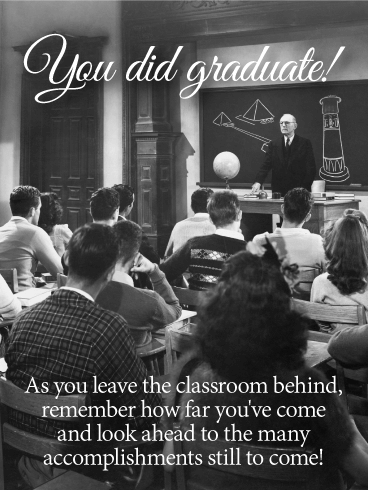 This vintage graduation card, with a classroom scene from decades past, will make them smile, while the inspirational words will fill them with pride. Because no matter how much they've accomplished so far, the best is yet to come! You did graduate! As you leave the classroom behind, remember how far you've come and look ahead to the many accomplishments still to come! The future looks bright for your proud new graduate! That's the spirit behind this inspirational graduation card, which features a group of excited students throwing their caps in the air as the sun beams behind them. This is such a special milestone in their life, and they've worked incredibly hard to get here. So it's the perfect time to remind them how far they've already come and help them look forward to what's still to come! The night sky is lit up with fireworks as a large crowd of new graduates cheers along, throwing up their hands and tossing their caps in the air. The image here creates a sense of anticipation, which your own superstar grad will be feeling as they celebrate a job well done. 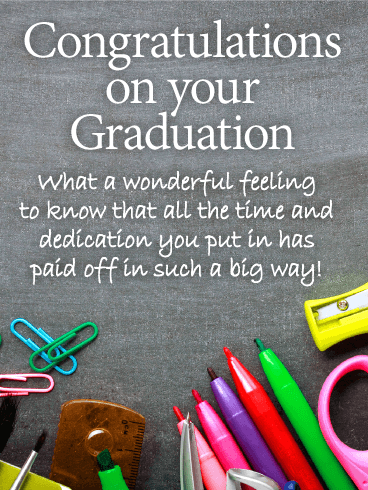 Whether they're moving up from middle school, high school, college or even graduate school, they're sure to feel proud when they receive this special graduation card! As they look back on today and look forward to the what's to come, it's important for them to always remember to follow their dreams! 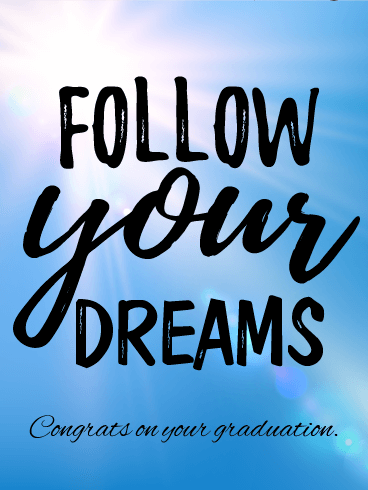 That's the inspiring message behind this graduation card, which shows a clear, blue sky and bright sunshine, adding to the motivational words. Wherever life takes them next, give them the opportunity to reflect on all that they've accomplished with your thoughtful sentiment. 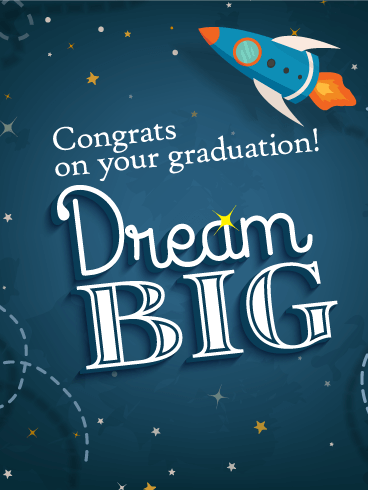 This stellar graduation card comes with a very important message: "Dream Big!" As a rocket ship launches up into space from the starry sky behind, your special graduate will be beaming with pride, knowing the sky's the limit for what they can accomplish next. They've already come so far because of hard work and determination, so this is a chance to let them know to always keep looking above and beyond! A big "HAPPY GRADUATION!" wish is boldly displayed across this sleek graduation card, which features a bright ring of stars that shine all around. It's a way to express how proud you are of their accomplishments and all the hard work and dedication. It took to get this far. Whether it's a friend, family member or fellow student, let them know you are thinking of them and encouraging them at this important time in their life. 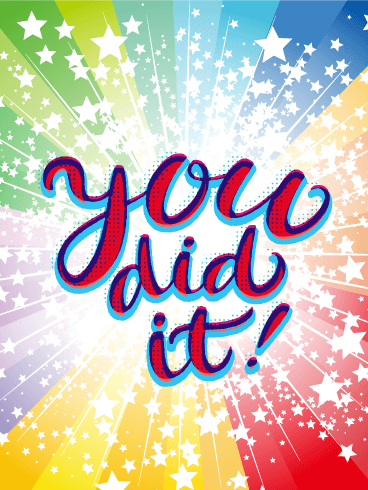 "You did it!" 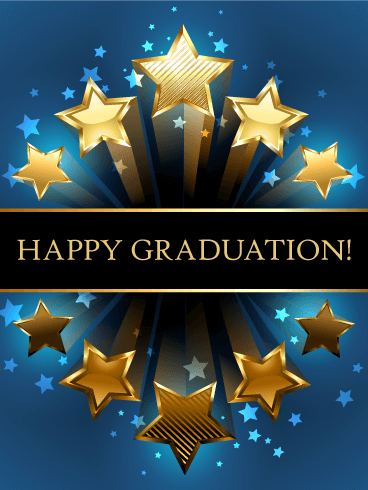 Three simple words say so much in this festive graduation card, which features a rainbow of colors and stars all around. It's a way of letting a proud new graduate know that all the hard work they put in and all the dedication they showed through it all, has paid off with one huge accomplishment. Whatever their age, they're sure to appreciate your inspirational words as they take the next big step in life. All the hard work is behind them and now it's time to party! 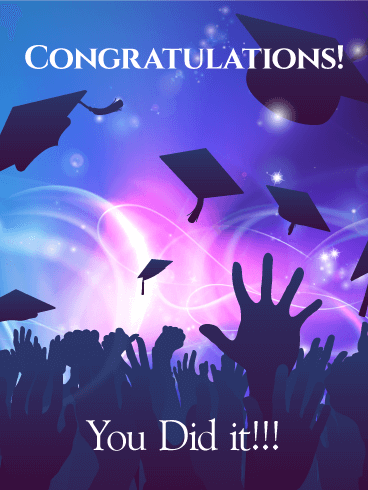 This fun and festive graduation card comes with a colorful burst of balloons, streamers and graduation caps, all helping to wish the special graduate in your life well as they celebrate this big and important milestone. Whether it's from grade school, high school, college or a higher degree, make them feel proud of their accomplishments, today and always! 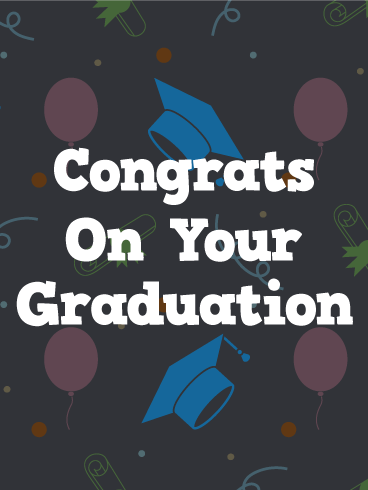 The message may be simple, but these three words will mean the world to your special graduate! The image of a young man wearing a cap and gown-his diploma in hand and a bright future ahead of him-is symbolic of the path that lies ahead for the superstar in your life who is ending one important chapter in life and ready to take on the next one with pride and determination! 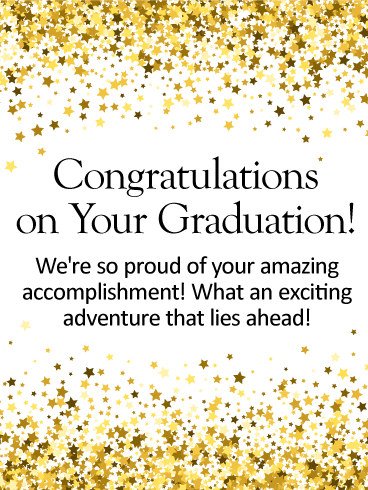 A bright blue background and a glittering stream of stars will have a special new graduate beaming with pride, knowing you took the time to congratulate them as they celebrate an important milestone. The best part of this graduation card is the inspirational message included: "I can't wait to watch you shine as you enter the next exciting chapter in life." An accomplishment to be proud of! Do you have an alumnus you are proud of? Let them know! 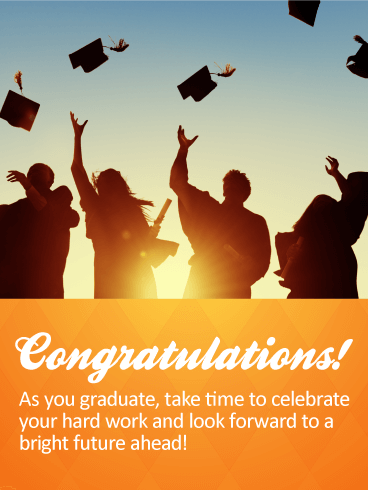 Send a congratulatory graduation card and share in the celebration. They have worked so hard, and deserve every pat on the back. Toss the graduation cap into the air and cheer them on! 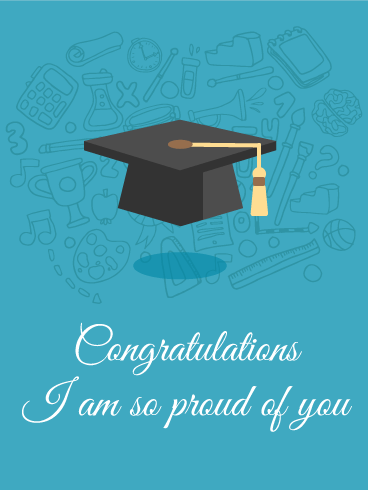 Or rather, send this graduation card full of fun college symbols to say just how proud you are! 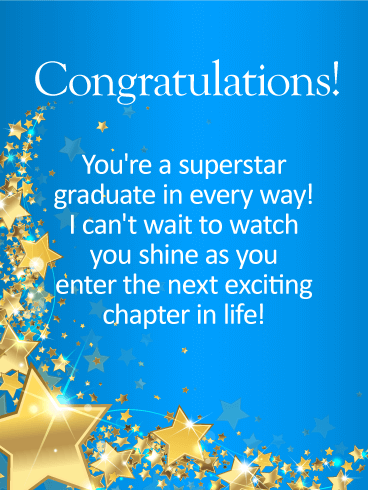 A sea of stars frame the inspirational words in this graduation card, letting someone special know that they continue to shine bright in your eyes, especially with their latest "amazing accomplishment!" 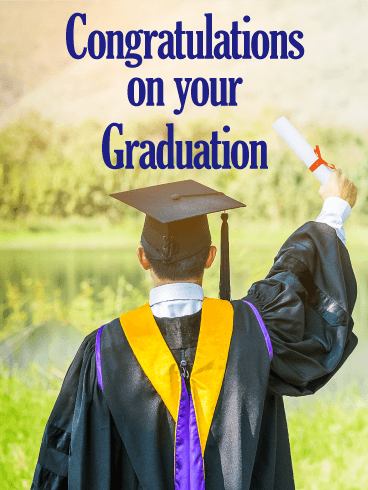 This time can be very exciting and emotional for any graduate, but knowing they have your support and encouragement will provide comfort as they see what exciting adventures lie ahead." All the tools it took to help them get to this point are gathered together on this colorful graduation card! And while they may be thrilled to say goodbye to pencils, calculators and highlighters at the moment, it's important to remind them that they're all symbolic of the hard work and dedication they displayed each and every day leading up to this incredibly special milestone.